HILDALE — Mayor Philip Barlow was somber Tuesday as he pondered the difficult day his city was facing. "We're just greatly humbled by this, but we realize this is an act of God. This is something we can't control," he said. "We have to take what we receive and do the best we can." Searchers digging through mud and debris recovered bodies of nine children and three women who had been missing since Monday afternoon when they were swept away in a powerful flash flood in Hildale. Crews planned to continue searching for one more missing child Wednesday. But as one tragedy was nearing an end, search and rescue crews were called to nearby Zion National Park Tuesday afternoon where four adults were confirmed dead and three more in their group were missing following heavy rain in a slot canyon. In all, heavy rain and flash flooding claimed the lives of 16 people and potentially 20 people overall during a disastrous 24-hour period in southern Utah. A day after a flash flood carried away two vehicles with 16 people inside — three adult sisters and 13 children — Barlow reflected on the torrential storm and flash flood that claimed the lives of 12 in the largely polygamous city of Hildale, and likely 13. "I've lived here all my life, never seen anything like it," he said. "It happened too fast. By the time we had the National Weather Service on the phone, it had already happened." Barlow confirmed members of two related families were in each of the two vehicles. Joseph Jessop, who spoke on behalf of his family, expressed gratitude for the support and sympathy his family has received, even by those who were not part of the Fundamentalist LDS community. "We know God is guiding all things, and trust in him to heal our wounded hearts," he said while standing next to his young son, also named Joseph. According to Brian Johnson, the brother of the three adult women who were killed, young Joseph Jessop was one of the miraculous survivors. Johnson told NBC News that his sisters Josephine Annie Jessop, Della May Black, and Naomi Jessop were the three adults killed in the tragedy. All were mothers. Josephine Jessop's oldest son was young Joseph who survived the incident because he got out to get help, he said. "They were all in the white van. He jumped out of the vehicle to get help and a wall of water hit the vehicle and swept it away," he said. "It looked to be about a 40 foot drop that they went off. Most of them were in car seats and seat belts and that's what made it so difficult to evacuate them." The names of the victims were not officially released Tuesday. The children ranged in age from 4 years old to their teens. Although Johnson said he left the FLDS Church and had not spoken to his sisters for several years, he recounted fond memories to NBC of each sister. Josephine Johnson worked as a teacher before having her children. "Jo was more quiet and she would just help out. She was quite a sweetheart. She was good in school and taught grade school for several years," he said. "Della was quiet, the exact opposite of Naomi," Johnson said. "She sold dresses, she was a seamstress. She was quite accomplished at it." He described Naomi Jessop as the "perky" sister and a "real good" mother. "She was a real happy person. She would laugh and joke around a lot," he said. Units from the Utah National Guard arrived in Hildale Tuesday evening and were scheduled to help search for the last victim — a child. The ninth victim, the body of an approximately 10-year-old child, was found about noon on the Arizona side of the border about 5 miles from where the car he was riding in was found. Another body was found about an hour later and two more an hour after that. The 12th body was recovered nearly 6 ½ miles downstream from where the vehicles were found, Washington County Sheriff Cory Pulispher said. The three survivors, all children, were treated at a local hospital and later released, he said. Utah Lt. Gov. Spencer Cox visited Hildale and its twin city, Colorado City, Arizona, to offer his condolences. "Our hearts are broken for the good people here of Hildale (and) Colorado City," he said. "Obviously this is one of the worst weather-related disasters in the history of the state of Utah." An estimated 650 law enforcement searchers and local volunteers were on scene Tuesday helping to dig through sand and mud along the banks of Short Creek. Members of the Utah National Guard were also called out to assist in the efforts. Hildale and Colorado City serve as headquarters of the FLDS Church. In the past, the remote cities have tried to stay isolated from the outside world. While the history between the polygamous border towns and both the states of Utah and Arizona has produced tense moments in the past, on Tuesday the lieutenant governor said state officials were fully committed to help the residents. "First and foremost, our hearts go out to the families of those who have lost loved ones. At this time, we just want Hildale to know we love you and we're thinking about you and that we're here to serve you. Hopefully this will bring the state and these communities closer together," Cox said. Some of those prior conflicts came out when the elder Joseph Jessop read a prepared statement to the media. While he expressed gratitude for the kindness that had been shown to his family over the past day, he also referred to the 2008 raid by Texas officials on the FLDS owned YFZ Ranch in Texas and more recently he said he lost his home in the controversy with the church's United Effort Plan Trust. A Utah judge took control of the trust controlling homes, businesses and properties in the FLDS communities amid allegations of mismanagement by leader Warren Jeffs and others. but now in an instant our families are gone." The incident began about 4:30 p.m. Monday when two vehicles, a full-size van and a Suburban, came to a crossing at Canyon Street near the mouth of Maxwell Canyon in Hildale where water was flowing down the street. 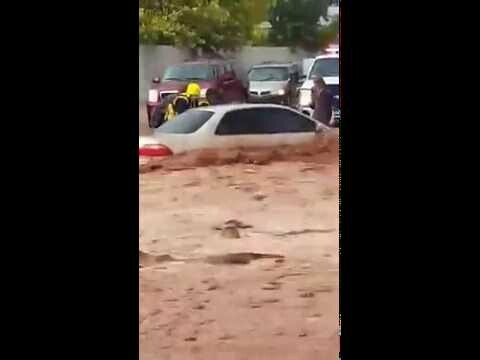 The group got out of their vehicles to wait for the flood waters to pass. "They had stopped because they couldn't cross," Barlow said. While they were outside their vehicles, with little to no warning, a wall of water came out of the canyon. "It went rushing down, and it actually came around behind the vehicles and engulfed them down," the mayor said. The 16 people got back into the cars — nine in the van and seven in the Suburban, according to at least one resident — before the vehicles were swept away. The two vehicles were found about a quarter-mile away down Short Creek. Pulsipher said crews weren't able to use aircraft to assist in the recovery effort because they couldn't see as well from the air as the searchers could from the ground. Some of the bodies recovered Monday had only a foot or hand sticking out of the sand, he said. Searchers with cadaver dogs walked along the Short Creek bed Tuesday. Local volunteers used horses to help search while women in the largely polygamous communities were seen in their traditional long dresses and boots digging with shovels. A large contingent of contractors using heavy equipment worked to clear thousands of tons of mud and debris from the Central Street creek crossing, the sheriff's office said. The rain also swept away at least one vehicle parked in a driveway in Colorado City and left red mud caked over many of the roads. Some residents were without power and water in Colorado City and Hildale, according to Pulsipher. Hildale officials issued a disaster declaration about midday. By Tuesday afternoon, many of the local residents began making trips down to the muddy creek banks where the mangled vehicles were pulled out of the water. The van was in two parts, apparently cut in half by rescuers. A child seat stood outside the crunched Suburban. Many stood quietly as they surveyed the severely damaged vehicles. Russ Cooke brought three of his children with him to see the wreckage. "These guys were about the same age as some of (the victims). I just want them to understand that these floods really mean business. They're not something to fuss around with," he said. Resident Levi Cooke said the usually 5- to 6-foot wide creek swelled to 40 feet across, sweeping sand, logs and even cars down river. "This is definitely the biggest flood I have ever seen," he said. Barlow concurred, calling it a "hundred-year flood." Even prior to Monday, he said city officials had been trying to come up with a plan to turn that wash into an all-weather crossing, but a lack of funds held the project back. Maxwell Canyon and nearby Water Canyon are known as popular destinations for county residents and canyoneers, and they are also an access point to the Canaan Mountain Wilderness area. Thunderstorms dropped 1 to 3 inches of rain late Monday afternoon in Hildale, said KSL meteorologist Grant Weyman. Passing showers continued during the night. The storm is one of many small remnants from Hurricane Linda in the eastern Pacific Ocean, which dissipated late last week. By Tuesday afternoon, the skies had darkened again and rain was falling. Gov. Gary Herbert, who is in Hong Kong on a trade mission, said he is heartbroken about the tragedy. "Jeanette and I express our sincere condolences to the families of the victims during this difficult time," he said. "I offer my thanks to first responders, volunteers and other officials involved in the recovery effort. Meanwhile, in Zion National Park, a group of seven people received a permit from the park to go canyoneering in Keyhole Canyon Monday afternoon. An estimated two-thirds of an inch of rain fell inside the national park within an hour about the same time. A search effort began when the group did not come out of the canyon. Their vehicles were found Tuesday. Four bodies were later located; three remained missing. The group was from California and Nevada and consisted of four men and three women in their 40s and 50s, according to park spokeswoman Aly Baltrus. The identities of the people confirmed killed were not immediately released, pending notification of family members. The search was called off early Tuesday evening because high water levels and rain showers had created additional flash flooding concerns. A press conference was scheduled for Wednesday morning at the park. According to park officials, Keyhole Canyon is a "short, narrow slot canyon located on the east side of Zion National Park. A permit is required for traveling through Keyhole Canyon and individuals must complete several short rappels under 30 feet and swim through several pools of water."